IF you're not quite into heights, we'd suggest you give a big miss to a new suspension bridge that's just opened at Whistler in Canada's British Columbia. Because while it makes for nice viewing of the alpine snow below your feet when you're at the top of its mountain, the actual valley floor and a lake within it that you'll find yourself also looking down on, are in fact over two-thousand metres – that's some two-kilometres-plus – down at the bottom of your mountain. 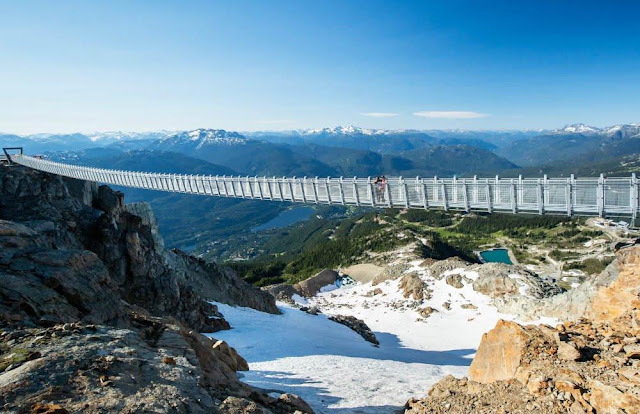 Wrapped up somewhat colourfully by one Canadian tour company as "an attraction for thrill seekers or the insane," and officially named the Cloudraker Skybridge, this amazing 130-metre long structure is the latest in things to do at Whistler Blackcomb, one of the largest ski resorts in the world. And it will also link Whistler's Peak with its West Ridge, where a new viewing platform will soon overlook the vast and spectacular Whistler Bowl all that way down. Just give this bridge a wide berth if you are a bit wary of heights… although if you are still kind of interested, while still a little nervy too, hop onto www.whistlerblackcomb.com to have a look at just what you could be missing. IF you don't like heights, this may not be quite your idea of a day's family outing. Because that lake and the little township next to it in this picture, are two vertical kilometres down from this new 130m suspension bridge from which this pic was taken in the mountains at Whistler, in Canada's British Columbia.